An interventricular conduction defect features a QRS > 100 ms that does not meet the criteria for a left or right bundle branch block. Causes include hyperkalaemia or tricyclic antidepressant overdose. Test almost all of your most important ECG rhythm interpretation skills with this case. This ECG is from a woman in her 70s who presented with severe shortness of breath on waking during the night. This was the initial ECG. This ECG shows a regular wide complex tachycardia most likely sinus tachycardia with LBBB. The cause was thought to be acute heart failure. This ECG is from a woman in her 70s who presented with severe shortness of breath on waking during the night. This was the repeat ECG after attempted cardioversion, BiPAP and nitroglycerin. This ECG is from a man in his 60s who awoke in the night with right sided chest pain, diaphoresis, nausea and vomiting. 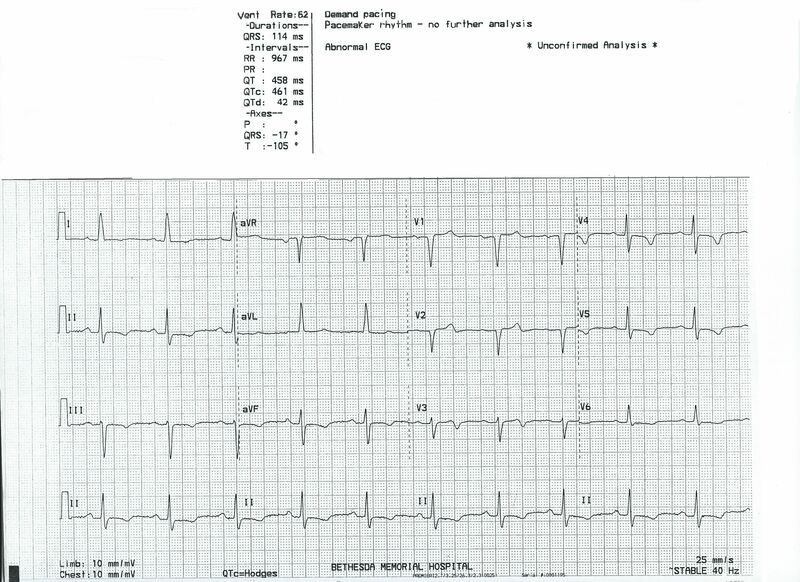 This was his first ECG recorded 8.5 hours later. This ECG shows intraventricular conduction delay with morphology similar to LBBB, excessive discordant ST elevation in V4. The cause was an acute anterior MI.